The Worcester quilted dog coat in Brown by Gor Pets is practical and comfortable with fleece lining and water resistant outer. This classic dog coat is stylish, comfortable and water resistant. The Velcro fastenings mean it is adjustable at the chest and neck. It also makes it easy to put on and take off your dog. 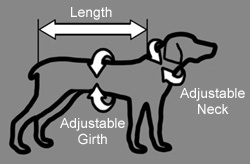 There is a hole for your dog's harness and lead if they want to wear their coat over the top.